Well, I´m not even sure if i´ve shown this photo before, but in light of not contributing to my blog for sometime, I guess this is the photo of the day. I haven´t been taking many pictures lately. 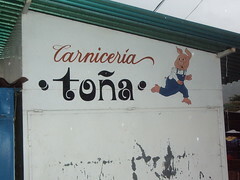 Pigs do have a lot of reason to run here as Mexicans have found many delicious ways to savor their flavor. ¨The Other White Meat¨ is probably the most popular here with beef at a close second. Many people seem to crave beef, or pork, but settle for chicken which is cheaper and No3 on the guts´most wanted list. It´s been really hot and stormy here lately. Hard rains often roar down in the early evening along with some pretty impressive thunder and lightening shows. At this point it´s a nice change from the hot and dry weather of early spring. Just read all your new posts. Looks good. I just finished figuring out how to post to my blog so the photos are linkable to larger ones. Sounds simple, but it has stopped me from blogging for the last month because I knew it was possible but hadn't figured it out. How do you like Flickr (I see you are using it? ).